Edward writes: This morning in Great Shelford we met in bright but coldish conditions but the forecast reckoned that the temperature during the day would reach 15C which it duly did. 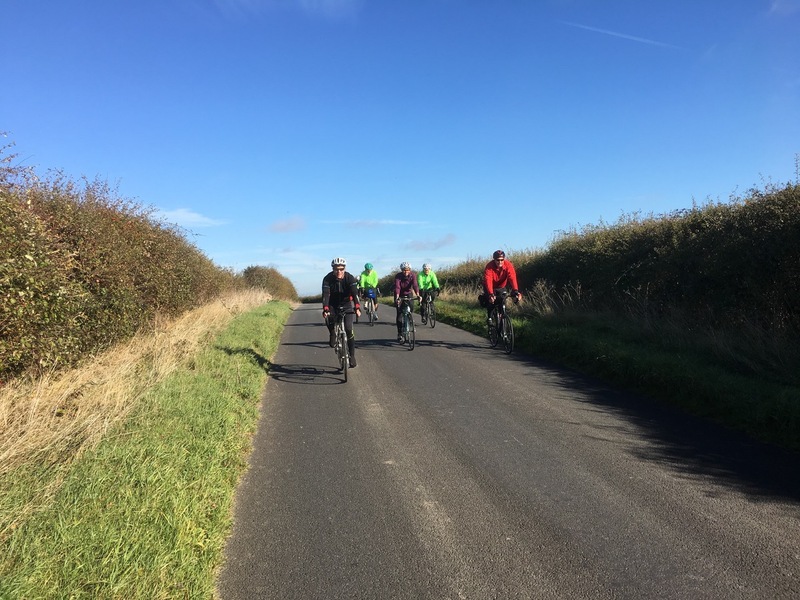 All day it would remain bright with the added bonus of minimal wind so all in all a pleasant day's cycling to look forward to. 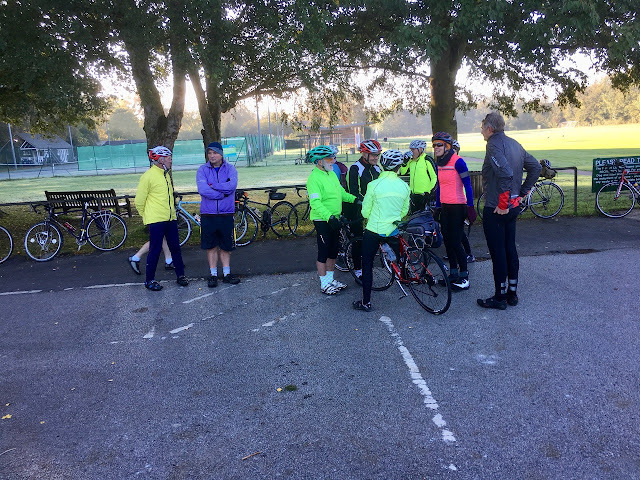 Obviously expectations were high as about eighteen cyclists decided to make the most of the good weather and remembering this would be the last Thursday ride before the clocks go back. Once again the ever-present Sheila was our leader for the ride out to Ickleton and Thaxted. 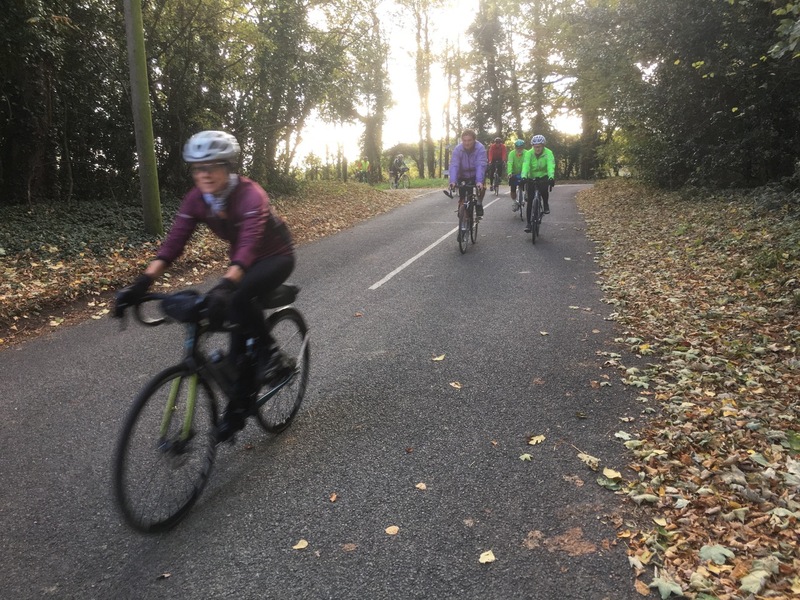 The big question of the day was how would Sheila turn the eight miles between Shelford and Ickleton into sixteen miles? The answer was very well. From Great Shelford we went to Little Shelford and Newton and then doubled back over the hill into Harston where we joined the A10 cycle way, past the Foxton crossing, and up to the Shepreth-Fowlmere crossroads. So far so good. Then it was Fowlmere, over the A505, Chrishall Grange and down via Duxford Grange to Duxford which left a mile or so into Ickleton and another mile to Ickleton Barns and, hey presto, we arrived at the coffee stop just after 11 am. and sixteen miles. Pretty neat. Already there were the slickers with their half dozen plus some 'independents'. With the temperature rising many chose to sit outside and enjoy the autumn sunshine until it was time to go. We started the second leg by returning to the village and took the long climb up to Elmdon and with the gain in height we were able to marvel at how beautiful the countryside looked bathed in the bright sunshine. Already the new crops are out of the ground showing as a green sheen over the fields. 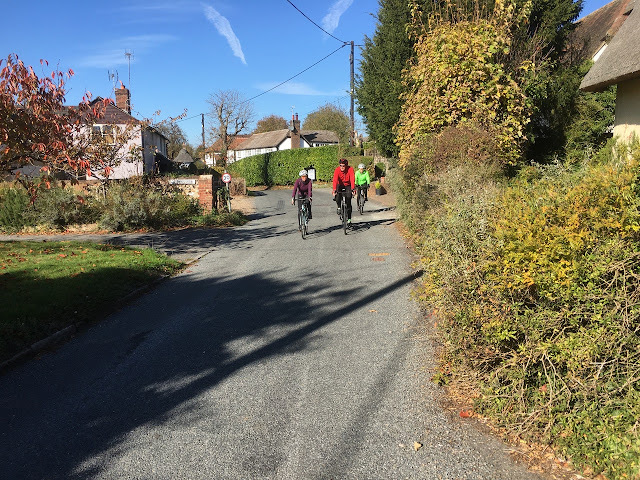 After Elmdon we joined the B1039 and it looked like we were making for Wendens Ambo but there was a surprise in store as we turned off and headed up towards Newland End and this was followed by the run down to Arkesden. A bad piece of driving compounded by a second bit of bad driving necessitated a ticking off from Sharon but the response wasn't remorseful. No surprise there, then. 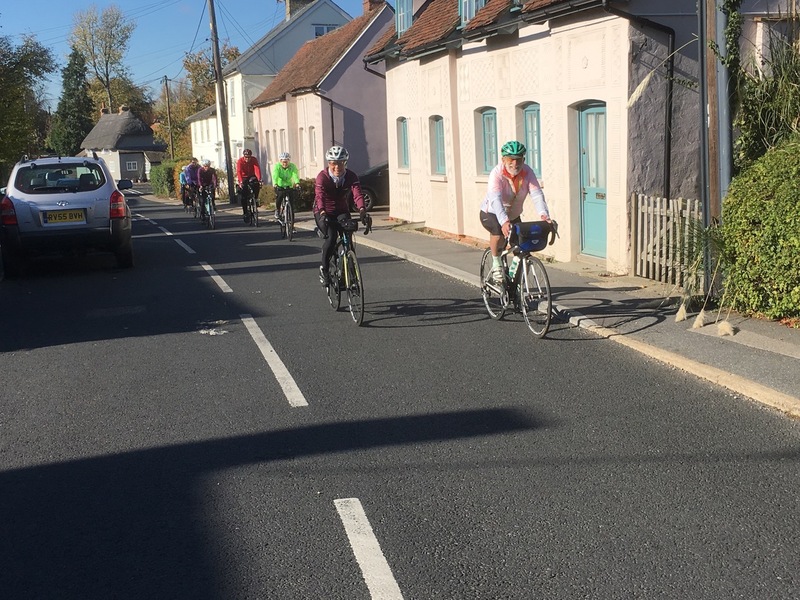 So from Arkesden we did arrive in Wendens Ambo, just by a more circuitous route, and soon after we came to Newport. 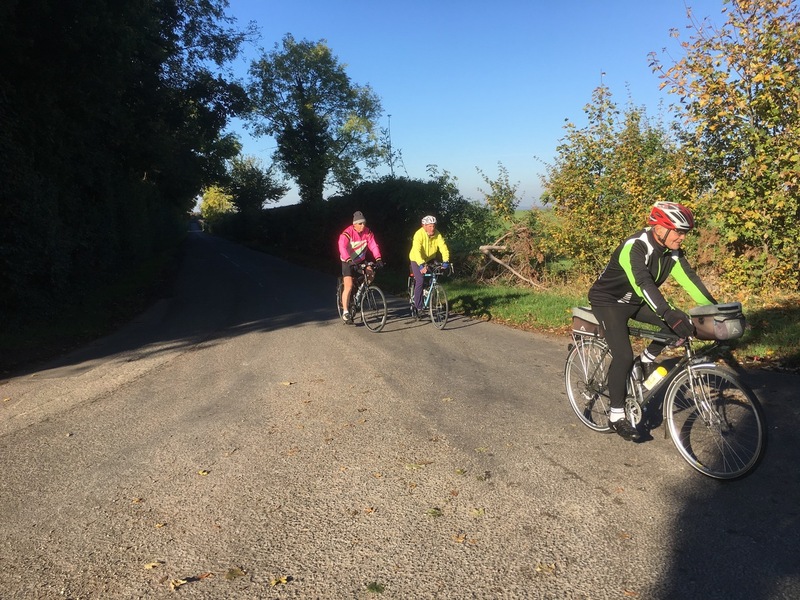 This meant a bit of climbing as we made for the Debden crossroads and four more undulating miles brought us to Thaxted and lunch/sandwiches. The Swan hotel had been booked and about four did go there with others going to Parishes plus the packed lunch brigade. The city group left first and a bit later Sheila led off with nine others in tow heading for Little Bardfield followed by the hilly, but attractive, stretch through Hawkspur Green. Still on quiet roads we came to Great Sampford where a little detour along the quaintly named Sparepenny Lane proved it should only be a one-off experience; it started alright but soon become a bit too rustic. Mountain bikes only. All unscathed we joined the busier B1053 up to Radwinter followed by three more miles into Ashdon. 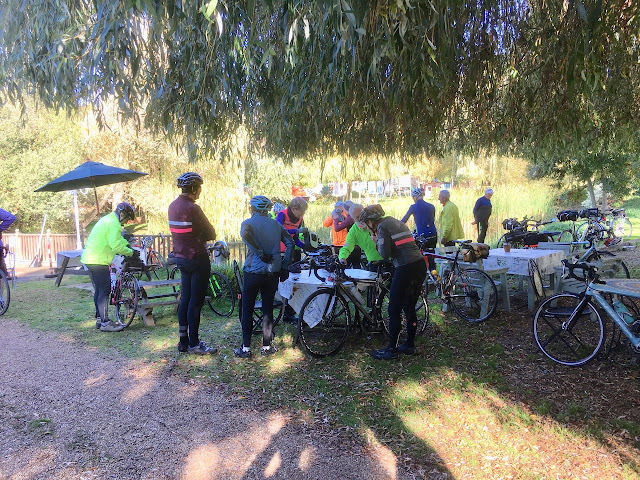 To finish the ride we went through Bartlow, Linton and Little Abington leaving the farm track to Babraham, Sawston, Stapleford and finally Great Shelford finishing at 4.30pm and 60 miles to remember under our belts. A special thanks to Sheila for devising a route which could have been routine but turned out to be anything but.